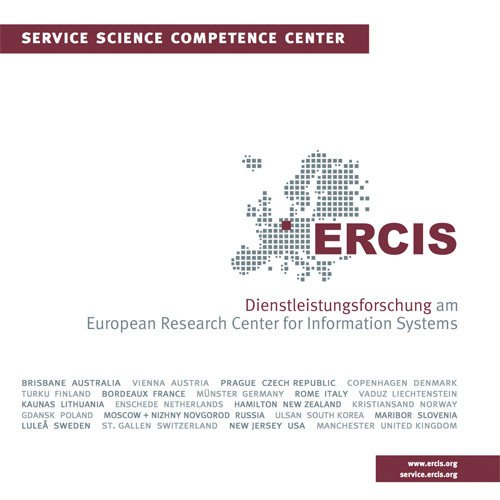 MKWI 2012 | ERCIS Competence Center "Service Science"
The ERCIS Service Science Competence Center was involved at MKWI2012 by hosting to sub conferences. First, Ralf Knackstedt again co-chaired to conference on "Service Engineering & Management" (http://mkwi2012.de/themen/service-engineering-und-management/), together with Oliver Thomas (University of Osnabrück), Markus Nüttgens and Tilo Böhmann (University of Hamburg), and Jan Marco Leimeister (University of Kassel). Second, Jörg Becker, Daniel Beverungen, and Michael Räckers chaired the conference "Digitale Netzwerke in Unsicheren Umwelten" (Digital Networks in Uncertain Environments) (http://mkwi2012.de/themen/digitale-netzwerke-in-unsicheren-umwelten/).